At Grace, there are many ways that your children can be involved and cared for — from VBS in the summer, to Sunday mornings’ Grace Kids or Childcare, to the Kids’ Place At Grace Preschool. For parents, we have plenty of ways to volunteer, along with social media and an app.
) for more information about scholarship opportunities. ***This year, nursery care and Preschool VBS is available to children of volunteers ONLY – please indicate your need for childcare and/or if your preschooler will be attending VBS in your volunteer registration. We look forward to seeing YOU at Power Up VBS! Current 2018-2019 4th and 5th graders join us this summer, June 10-13 (9:00 am – 1:00 pm), for an experience put together especially for you! 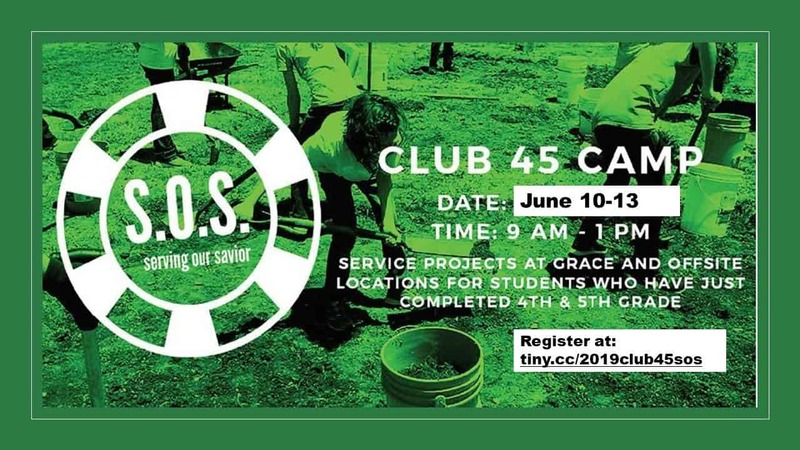 Club 45 Camp S.O.S. is designed to share the reality of God’s unwavering and abiding love for you and to give you opportunities to share that love with the world! During the week you will experience crazy fun with team building activities as well as spend time in real life mission outings around our church and our metro area. This is a week you will not want to miss! Cost is $25 and includes t-shirt, daily snacks, catered lunch on Monday and more. Grace Kids is an awesome Sunday morning experience, designed especially for kids! We have age-appropriate classes for children two years old through 5th grade. At Grace Kids, we are passionate about teaching kids to Love God, Live Like Jesus and Serve the World while having fun at their own level. There’s a time for worship, games and an age-appropriate lessons. Grace Kids begins at 9:15 each Sunday except for the holiday weekends. On the fifth Sunday of each month, we take time to intentionally worship together as families in the sanctuary. As our kids grow and mature, we want them to not only have experienced dynamic, intentional ministry in environments geared for their age, but to have also experienced truly feeling like members of the congregation who have a place in the body of our church. Family Sunday services are still geared toward adults, but they are kid-friendly in the sense that kids in service are given permission to be kids. We acknowledge that they will not always use an inside voice. They will wiggle and complain and spill and fall and laugh a little louder than everyone else. And we think that’s awesome! We want kids to be who they are and know they are accepted. Every Sunday, our volunteers show up and work together in their unique roles to create a loving, fun and safe environment for our kids. Grace Kids is completely fueled by volunteers. We could not exist without their leadership and expertise. We would love to talk with you about joining our team. If you are interested and would like more information about volunteering in Grace Kids, please contact Grace Kids Ministry Director Stacy Guerrero (link to email). Small Group Leaders connect relationally each week with a group of kids (grouped by age level) in activities and discussion about the morning’s bottom-line. All lesson activities and supplies are provided! Commitment is 2 times/month 9:00 am to 10:30 am. Gifts and Talents needed: Teaching, nurturing, leadership, encouraging, LOVE TO HAVE FUN AND LOVE KIDS! Guest Services makes the best first impression by greeting first-time guests and guiding new families through the registration and check-in process to make them feel welcome and informed. Commitment is 1 time/month, 9:00 am – 9:30 am. Gifts & Talents needed: Helping, welcoming, hospitality, enjoys meeting new people. Support Team helps with behind the scenes work such as copying, cutting, hole punching, organizing etc. Commitment is 1-2/month at your convenience. Gifts & Talents needed: helping, serving. Special Needs Team help provides a safe, caring environment where children with special needs learn about God’s love for them. Volunteers are a classroom “buddy” to children to help them get the most out of their group time. Commitment is 2 times/month 9:00 am to 10:30 am. Gifts and Talents needed: Nurturing, encouraging, patience, flexibility. Worship Team leads kids in song with energy and enthusiasm to worship God for who God is and what God has done. Storyteller communicates the Bible story and Bottom Line in such a way that it becomes unforgettable to a child. Because our themes last a month, commitment ideally is weekly for 1 month, Sundays 9:20am -9:50 am. Stage Design Team decorates the large group space to coordinate with the monthly themes. Commitment is once a month (between the last Sunday of the month and 1st Sunday of the new month). Gifts & Talents Needed: Creativity, willingness to share your talent. Follow Grace Kids on Facebook! Parents, we have an App that is just for you! Please download the Parent Cue App here or find it in your App Store. This will help you guide conversations with your kids throughout the week that encourages them according to what they are learning in Grace Kids! We encourage you to use this resource! 5:30 Saturday, 8:00 & 10:45 Sunday services: Birth-Kindergarten. Childcare is available for all worship services without registration. For life-groups and other classes during the week, as well as special events, childcare is available, with pre-registration, for children birth through 5th grade. For most events, childcare takes place in Room 209. Is there an area for me to nurse my child? There is a nursing mother’s area located in our family room (Room 208), located across the hall from the childcare room. There are rockers and a diaper changing area, along with toys and a television with a live video feed of the service. How do I check my child in/out of childcare? We’ve learned the best goodbyes are brief, and separation becomes easier over time. Our leaders will engage your child in fun activities, but if your child cries for an extended time, we will contact you. Please make sure you have a cell phone number listed on your tag at check in. To pick up your child, present your matching security sticker to the staff and your child will be released to you. Our security is paramount, and we will not release a child to anyone without the proper matching label. Don’t forget to take all your belongings when you leave. Please label all baby’s items, including pacifiers. Upon check-in, these items will then be placed into a numbered cubby in the childcare room. Who cares for children in nursery and Sunday School? All workers are certified with the Kansas East Conference of the United Methodist Church. Background checks are performed before final approval is given. They attend training and are required to be certified in first aid, infant/child CPR and use of our AED. At least two trained child care workers must be on duty whenever children are scheduled to be in attendance. Kid’s Place at Grace sees each child as a unique individual, created by God. We provide a warm, nurturing, fun and positive environment that is designed to promote the development of the whole child, including social, physical, emotional, spiritual and intellectual growth. Our curriculum encourages each child’s creativity, curiosity and positive self-esteem through age appropriate, hands-on activities. The Staff at Kid’s Place at Grace must pass rigorous screening, education, and experience qualifications to meet or exceed those required by the state of Kansas and Grace UMC. Each teacher participates annually in continuing education opportunities to broaden and increase skills to make a positive contribution to the education of your child.